Vacations for Dogs, Dog Vacations, A Vacation with your Dog! Dog Vacations or any family vacation where you can bring your dog makes a vacation far more fun and enjoyable for the entire family! 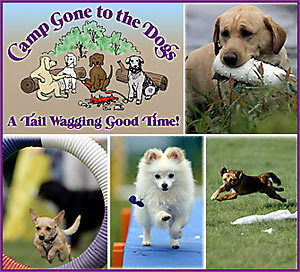 Dog Camps offer quality camping time with the center focus on fun activities that you and your dog can enjoy together. DogDog Friendly Hotels and Motels that allow Dogs means that your beloved pet can enjoy a vacation with the rest of the family and ends separation anxiety while the family is gone. Be sure to look for Camps For Dogs or Vacations where dogs are welcomed to make the most of your holiday time.